Normally, I don't have a lot of nice things to say about moose. They're big and dumb and don't respect property lines. They are constantly walking through our yard, across our deck, eating our lilac tree, and pooping wherever they like. But I feel sorry for this guy. 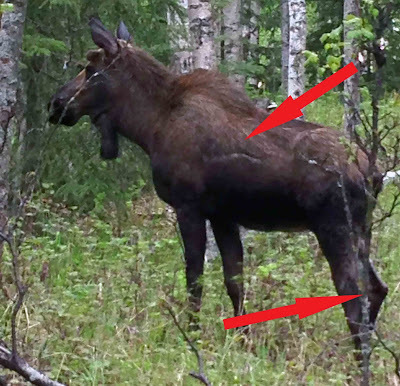 He seems fine in this picture, but if you look closely you can see the gash across his side, which actually is not the worst part (so many moose possess that same kind of scar—probably from scraping against fences and railings as they run through people's yards). You also might notice that he's not placing any weight on his back right leg. When he started moving, he walked with a horrible lurch. I don't know if he'd broken his leg or dislocated his hip or what, but his laborious movement was the most pitiful sight. He won't be long for this world with a lame leg, poor thing. If I would I have been thinking, I would have switched my cell phone camera over to video so you could see how bad his walking was. Actually, that's not true. I don't think I would have posted video. Too sad. Just between you, me, and the lamppost . . . this guy is welcome to nibble on the lilac tree any time he wants. I keep looking at this poor old moose and hoping that there will be something new on your blog. Please don't abandon it. It has been so good and such a nice way to keep up with you.